Somewhere else I've written that for AAA baseball it's the Division Championship that matters. 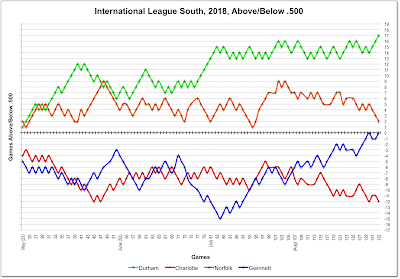 Come September the playoffs are driven by call-ups, the quality of the AA franchise, and the ability of team leaders, managers, and coaches to sustain team cohesion. In other words, something of a crapshoot. So, last night's clinching of the South is a big deal and says a lot about the team and the Rays. The hero was new guy Austin Meadows (MiLB.com story here) who hit three home runs, a single, and took a nasty high and insider off a protective arm. That last event led to two ejections and a bench-clearing moment or two. Tonight could be ugly. They also reached a season high 19 games above .500. 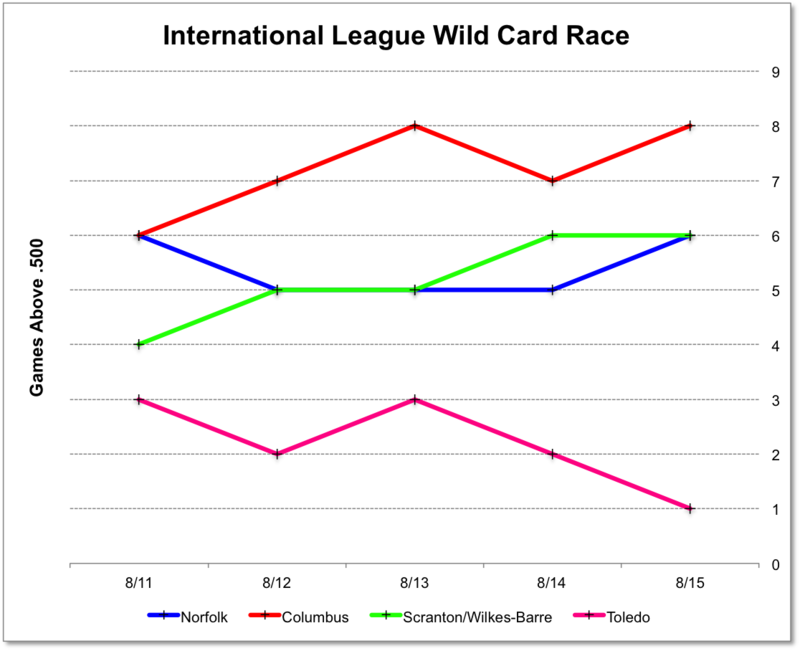 Meanwhile, Columbus has surged to a one-game lead over Indianapolis in the West. They are playing for the opportunity to host the Bulls on September 5. 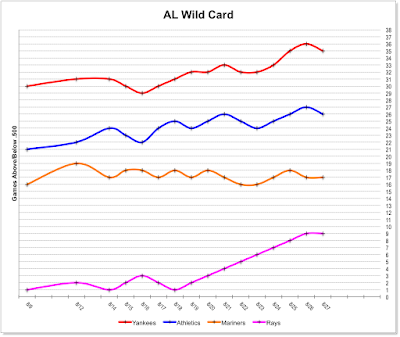 The Wild Card competition remains wild. The International League announced its 2018 Awards list yesterday — a big day for the Lehigh Valley IronPigs — not so much for anyone else, especially if you're a Durham Bull. The Bulls and Tides stopped play two outs into the 6th inning over in Norfolk last night. They were tied 1-1. Box. My guess is that they will try to finish the game in Durham next weekend. Austin Meadows was at bat with a 1-2 count when they gave up. 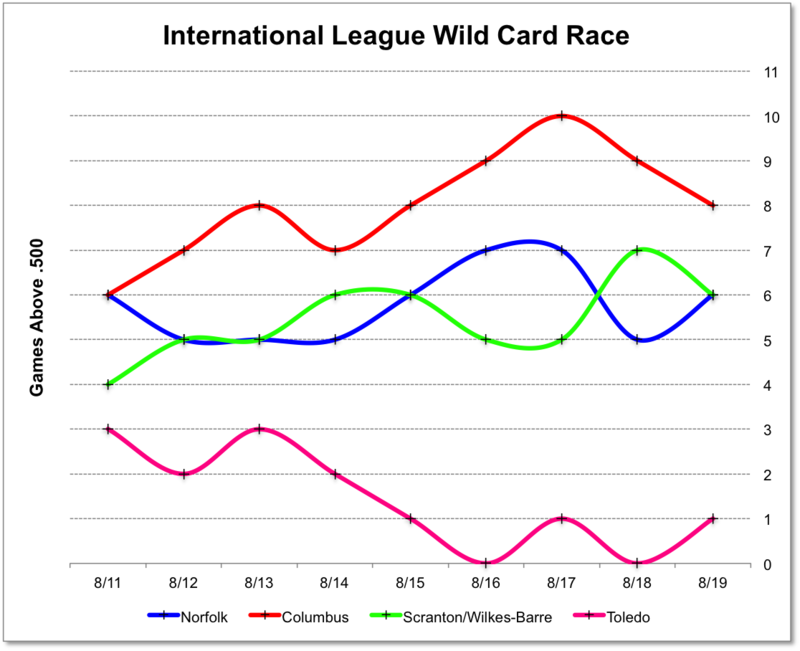 Meanwhile, the very odd International League Wild Card continues in its strangeness. 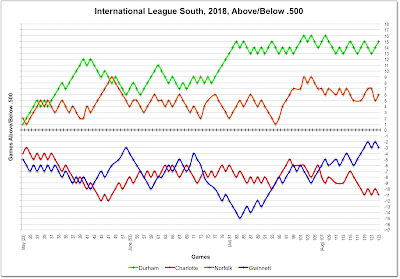 The oddness begins in the IL West Division where the Indianapolis Indians (Pittsburgh) and the Columbus Clippers (Cleveland) are tied for the lead. 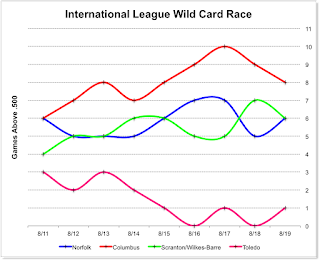 As it happens, that means, at the moment, they are also tied for the wild card slot where they are a game ahead of the RailRiders and a game and a half ahead of the Tides and the Mud Hens. 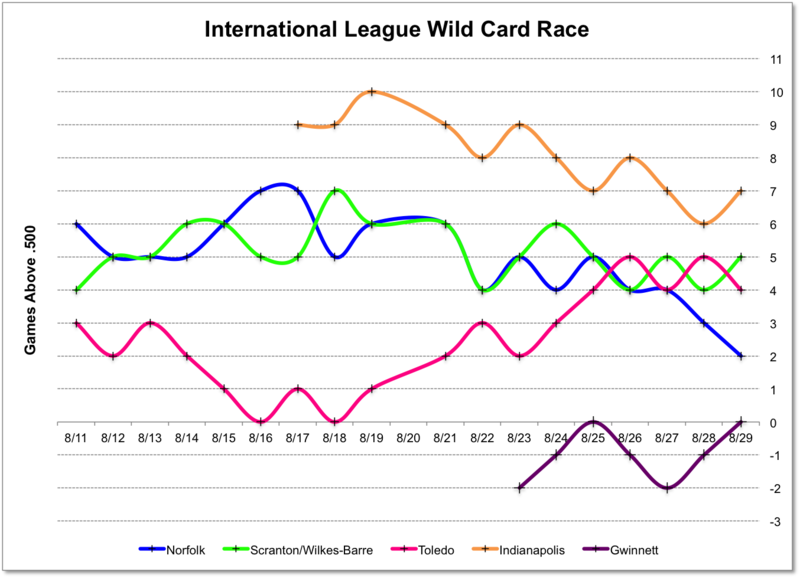 Up in the big leagues there's another interesting Wild Card run over in the American League, which has two wild card slots. 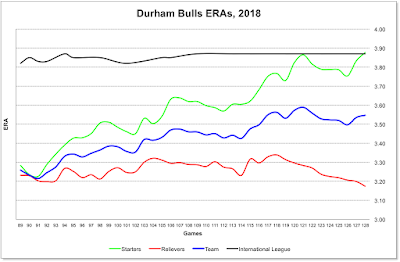 The Bulls' parent club, the Tampa Bay Rays has put together an extraordinary 8-game winning streak that has them edging upwards into competition with the Athletics and Mariners. 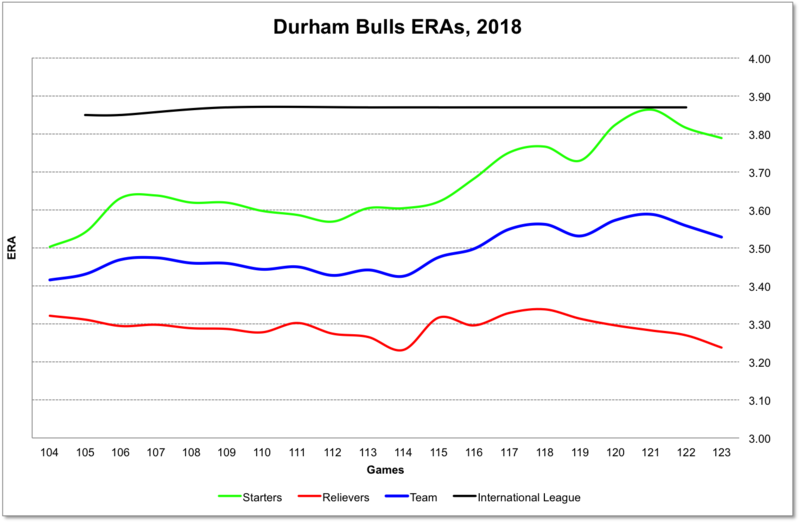 We remain concerned about Bulls' pitching as they go in to a 4-game set in Norfolk. 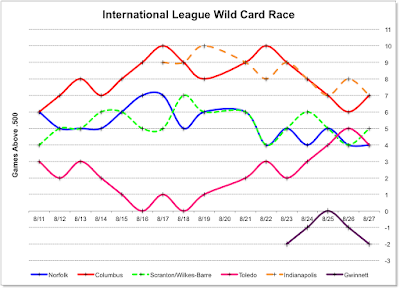 The starting crew has soared up to slightly above the IL team average for the first time this year, and all of that slippage has come since the All-Star break. 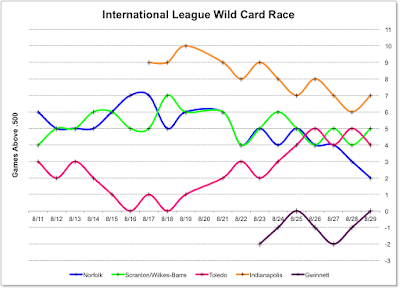 The Wild Card race is just ... odd. 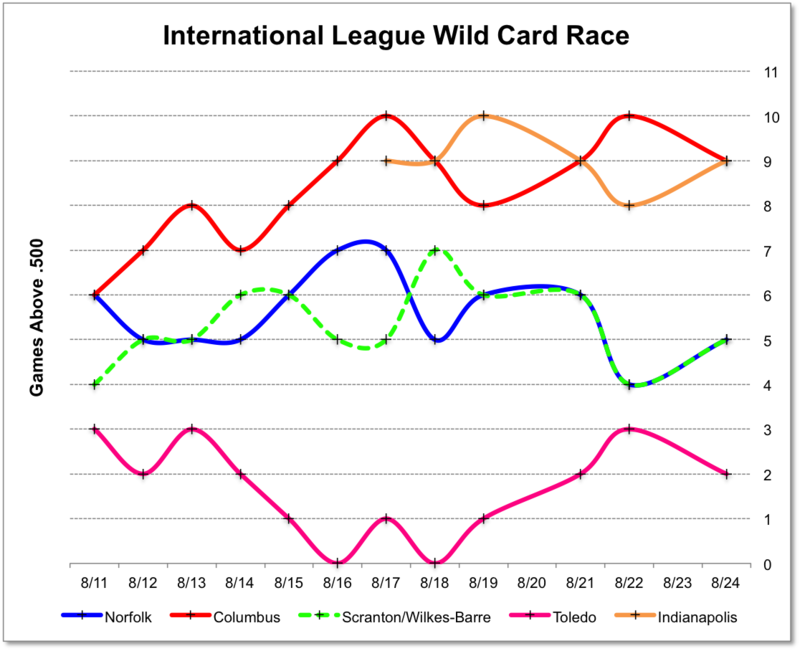 Indianapolis and Columbus are tied for the lead the the IL West and tied for the lead in the wild card. 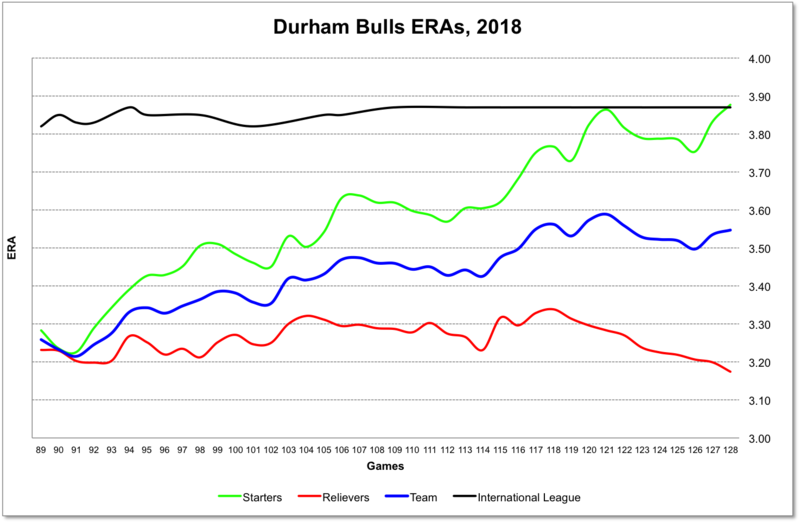 The Durham Bulls did just fine in this last out-of-division road trip, but hard times are a-comin. They start tomorrow. The Bulls are to play five games in three days against the Gwinnett Stripers. That will surely stress the pitching staff. 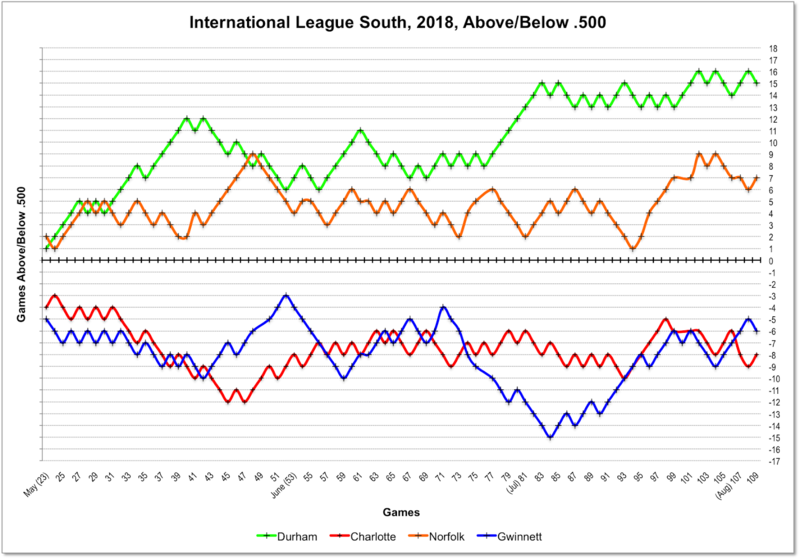 Then the Bulls hit the road for four games against Norfolk and three against Charlotte before coming home for their last hurrah of four more games against Norfolk. This could get really tricky with those 8 games against Norfolk. 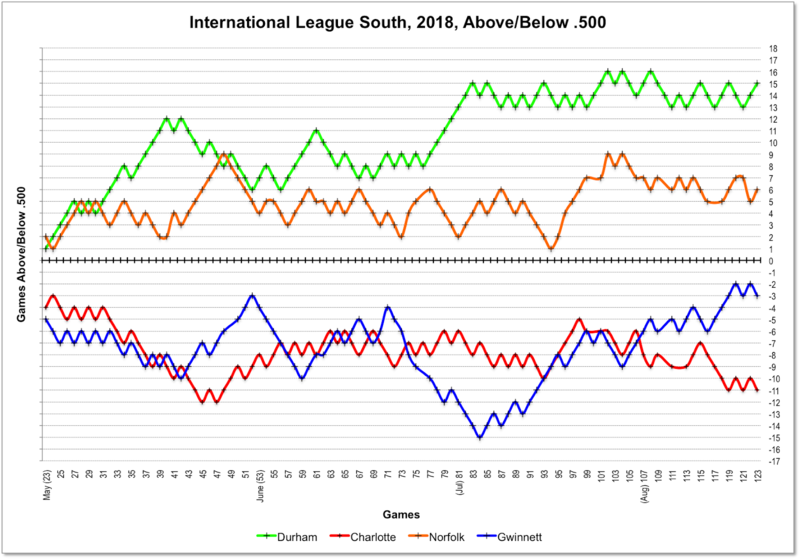 At the moment the Bulls are just 4½ games ahead of the Tides. 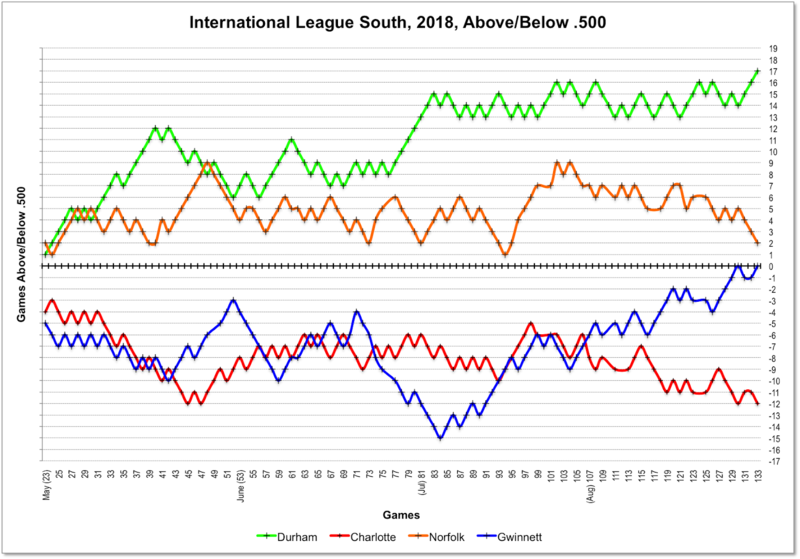 The spread between the two teams has been wobbling around quite a bit in August. 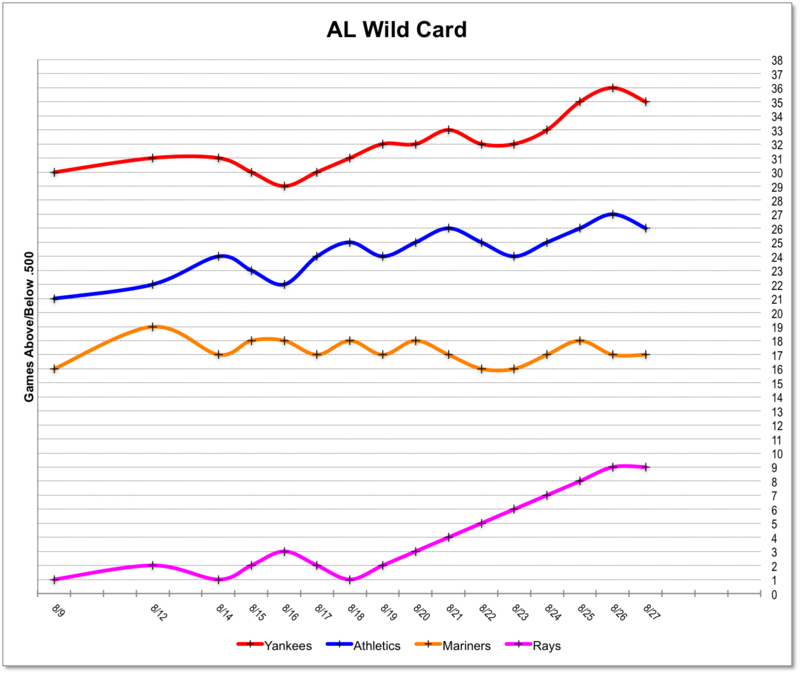 Meanwhile, the wild card is getting pretty wild. 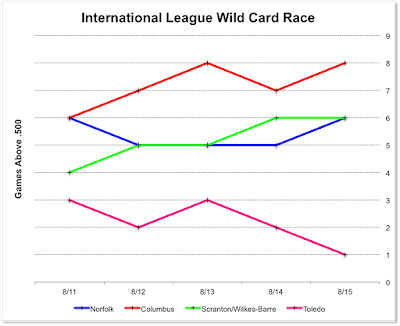 Indianapolis and Columbus are going at it in the West for the division championship and that means that there's currently a three-way going on for the wild-card, with the third member being whoever ends up second in the west. It would seem that Scranton/Wilkes-Barre has the best shot, but it really is up in the air. The Bulls did just fine up in Pennsylvania, taking 2 out of 3 against the Lehigh Valley IronPigs. The important takeaway, for me, was that Chih-Wei Hu finally had a decent game. Seems like a very long time (it has been, since late June) that he's done well in a Bulls uniform. Here's hoping he can keep it up. Meanwhile, time to think a bit about the playoffs. 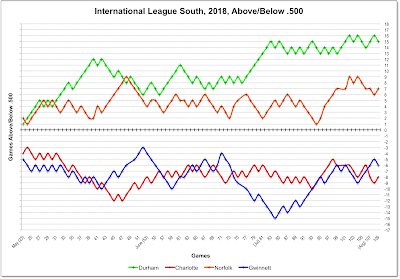 Here's how it works in the International League. The West Division Champion hosts the South Division Champion to begin a best of five series (after two games the site moves to opponent park). The North Division Champion hosts the Wild Card. Winner of North v Wild Card hosts the winner of West v South for the start of a best of five Governors' Cup Championship. So, it playoffs began today it would be the Durham Bulls at the Indianapolis Indians and the Columbus Clippers at the Lehigh Valley IronPigs. 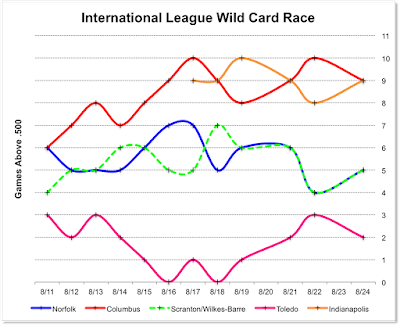 But, notice how tight things are in the IL West (standings) and how tight they are in the Wild Card race. Could be some changes by the end of the month (or even tomorrow). The Pawtucket Red Sox are usually a much better team than we've seen this year. That seems especially true given the absolute dominance of their parent club in the American League. They've got the best pitching (measured by ERA) in the IL, but are still 15 games behind the IronPigs. What I don't know is how much turmoil they've undergone this year. We had a couple of thrilling games in this home stand. A blowout of the Columbus Clippers on the 8th. Two games won by walk-off. But a couple of losses that were tough as well. Still, the Bulls left town remaining in first place in the IL South. 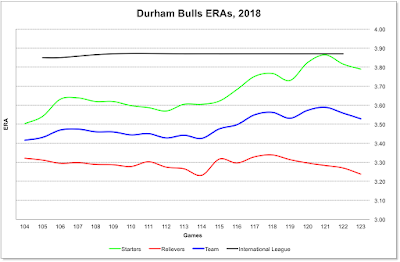 The Bulls are off to Lehigh Valley to face the team with the best won-loss record in the International League, the Phillies AAA franchise, the Lehigh Valley IronPigs. And the only other team that has its very own blogger. Check it out. Here's the oddity. 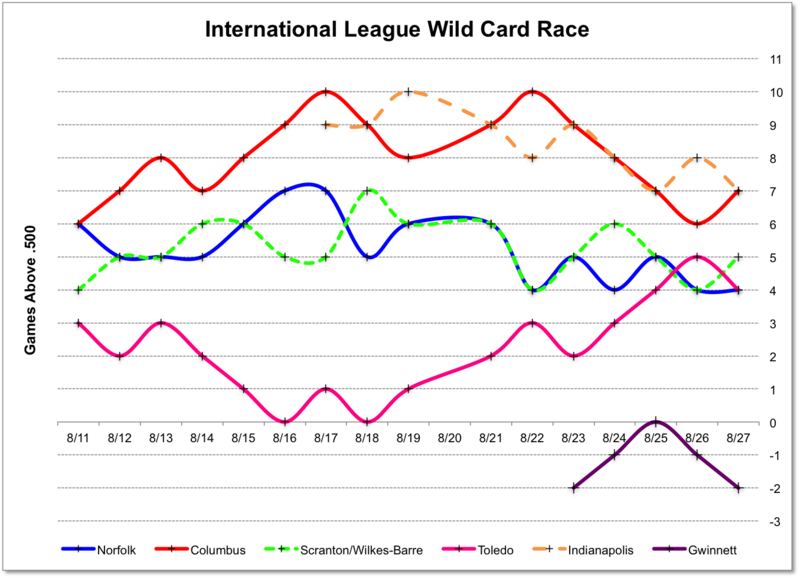 The Bulls and the IronPigs match up very closely in everything except won-loss records and run differentials. Now, if you run their run differentials through the Pythagorean Expectation formula it turns out that the Bulls "should" be 69-47, not 65-51. And the IronPigs "should be" 67-52, not 72-47. In that case, the Bulls would be the best team in the International League, not the IronPigs. Darn this pesky real world stuff!